UK Chancellor George Osborne has refused to rule out making further cuts to child benefit if the Conservatives win the general election in May. Speaking at a Westminster briefing on Tuesday, Osborne was repeatedly asked to rule out making changes to child benefit, but refused to do so. 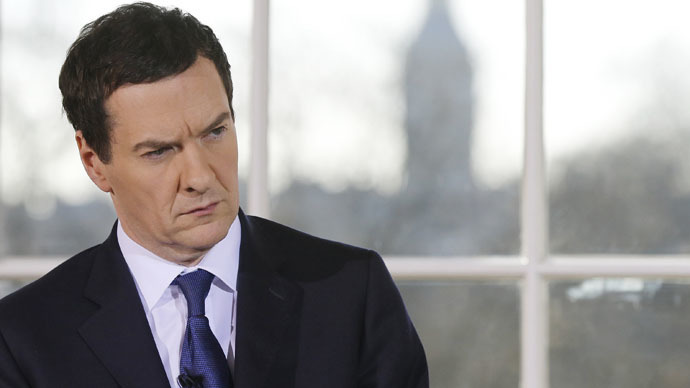 The Chancellor dismissed the idea child benefit would be merged into Universal Credit as part of wider benefit cuts. Universal Credit has been touted by the Tories as a long overdue simplification of the welfare system, as it merges six existing benefits into one. The right-leaning Institute of Fiscal Studies (IFS) published a report in February which suggested merging child benefit into universal credit as a way of saving £4.8 billion. The IFS said this would help the next Conservative government achieve its ambitious spending reduction targets. The Office for Budget Responsibility has said the Tories’ continued austerity drive will see public spending as a percentage of GDP return to its lowest level since the 1930s. Osborne has pledged to cut the UK’s welfare expenditure by £12 billion if the Conservatives gain power in the next election, but he has refused to detail how this will be achieved. State pensions are the only benefit which the Tories vow to protect from further cuts. When asked about child benefit cuts during a speech in Westminster on Tuesday, the Chancellor refused to rule them out. Osborne said: “You can judge us on our record in this parliament. If we wanted to put child benefit into Universal Credit we would have done it when we set up Universal Credit. Anti-poverty and inequality campaigners will take issue with Osborne’s claimed list of accomplishments. The Child Poverty Action Group have said that under current government policies child poverty will increase in the UK, with more than 4.7 million children projected to be living under the threshold by 2020. According to The Equality Trust, UK income inequality in among the highest in the developed world. In an open letter to party leaders published in the Sunday Times, the charity said: “This country has the fourth-highest level of income inequality of 29 developed countries. Chris Leslie, the Shadow Chief Secretary to the Treasury, said millions of families could suffer if the Conservatives merged child benefit into Universal Credit. “This would mean 4.3 million families losing over £1,000 a year, according to the independent Institute for Fiscal Studies,” he told the Guardian.